I wanted to post these ultra almost scary close ups because I think it makes the letterpress look scientific and kind of alive. The paper is cotton on all of these. The Dirty Byrd paper on the grey one looks crazy hairy and is probably my favorite of these ultra crisp…. they are kind of scary. 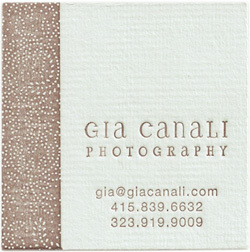 I hope it doesn’t frighten people away from elegant letterpress! This entry was posted in art, invitations, paper, photography, printing, tree free paper, wedding invitations and tagged Letterpress, printing, soy based ink, wedding invitations on July 12, 2009 by tinypine. I have been slammed. I will be honest. It was as if everyone was getting married on the same day this summer thus sending out their invitations on the same day! Now, that isn’t at all true, but that’s how it felt over at the Tiny Pine Press studio. 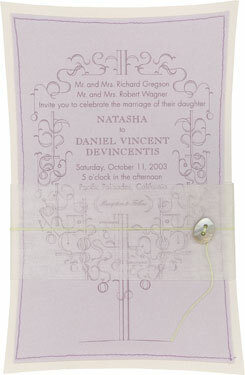 This new client was very detail oriented and wanted two lavenders attached to this beautiful cotton handmade paper. I searched for the perfect lavender plants and found a really wonderful local farm who supplied a bounty of lavender stems to choose from. They smelled great. and when we glued them on, and stacked all the invitations, the lavender scent emanated from the papers to fill the room…. yum! It was a fun afternoon of gluing. I had my good friend Sharon Lowe (who is a floral designer – smart right?) help me glue the lavenders. Sharon understands how the plants want to go… and even which ones. We chatted with the lavender stems all afternoon. And then a week later chatted them into the envelopes and off to the guests.. You know that plants have feelings too! 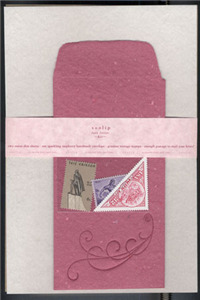 I think these lavenders were happy in their more permanent home, glued on these elegant invitations. I hope!! I think I am a pretty good communicator but if the lavenders aren’t happy, I fear they will get revenge on me by getting lost in the mail! or revolting and busting out of their envelopes or something. It happens (More on that subject later)! See… I AM delirious! Personification of Plants. Not a good sign…….. This entry was posted in art, invitations, paper, printing, tree free paper, wedding invitations and tagged Jeri Ryan, Letterpress, mail, soy based ink, tiny pine, wedding invitations on May 30, 2009 by tinypine.